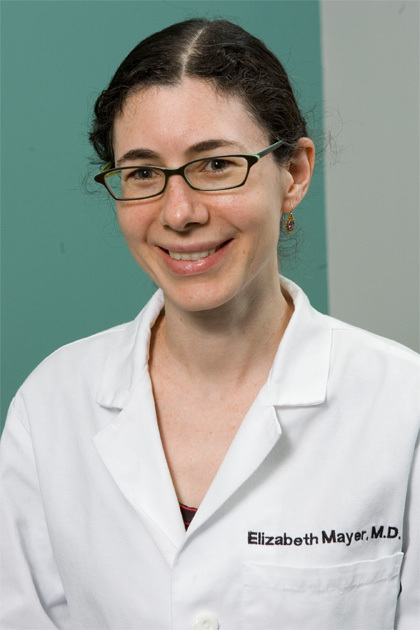 Elizabeth Mayer received her undergraduate degree from Yale University in comparative literature and her MD degree from Columbia University College of Physicians and Surgeons. She completed her residency in internal medicine and fellowship in rheumatology at CUMC and then joined the faculty. She is a member of both the Division of Rheumatology and the Division of General Medicine. She sees patients in AIM and in the rheumatology clinic, as well as patients with rheumatologic disease in the Herbert Irving Pavilion. Dr. Mayer evaluates adult patients in all areas of general rheumatology. Her clinical practice is committed to a multidisciplinary approach to the diagnosis and treatment of rheumatoid conditions in order to provide optimal patient care. She enjoys all her teaching responsibilities, and one of her favorite activities is supervising the house staff in General Medicine Clinic. In 2010, she received an award from the Ewig Clinical Education Fund.